On a hot summers day, nothing beats the feeling of sitting on a hard metal bench while watching your favorite team hit the home run of the season. Bring home the fun with these adorable white chocolate covered strawberry baseballs. Perfect for a summer bash or just for a little afternoon fun. 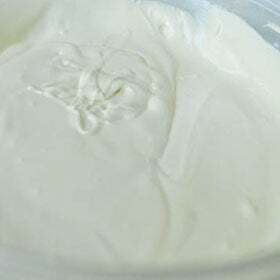 These sweet treats take just a few minutes to make and can be made a day ahead, leaving you plenty of time to get ready for the rest of the fun. Wash strawberries and then pat dry thoroughly. 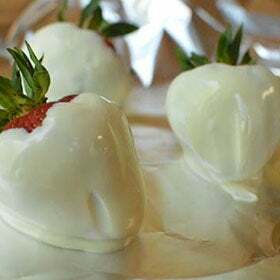 If your strawberries are at all wet, the chocolate will not stick to them. Using either a double boiler or your microwave, melt the semi-sweet chocolate chips until the chips are almost completely melted and the chocolate is starting to look shiny (around a minute in the microwave). Remove the chocolate from the heat source and stir until the chips are fully melted and the chocolate is completely smooth and shiny. If you overheat the chocolate, it might seize and start to look grainy, so err on the side of caution, even if it means taking the chocolate off the heat source multiple times to check whether it is ready. 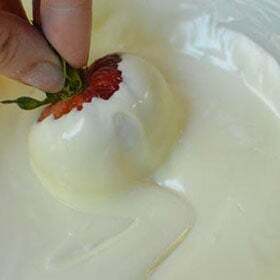 Holding the stems gently, dip each strawberry into the melted chocolate and swirl it around until it is fully coated. 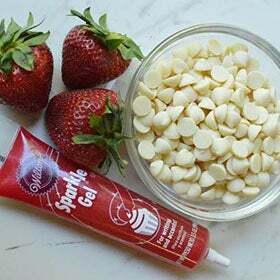 With red decorative gel or with red candy melts, carefully pipe the stitching onto each strawberry. Refrigerate until the stitching has set, but, unless it’s very hot where you live, don’t store your strawberries in the refrigerator. Instead, store in plastic container placed in a cool dry place so the chocolate doesn’t sweat. Serve to adoring fans and enjoy!